Everybody will know by now that Elizabeth Wallfisch has a special interest, affection and regard for the 17th- and 18th-century Italian violin schools. She has already recorded much music by the likes of Tartini, Corelli, Locatelli and others with her group, The Locatelli Trio, and also with The Raglan Baroque Players under Nicholas Kraemer. Here is a varied and fascinating collection of pieces by some of the lesser-known composers from a generation or two earlier than those composers. In the not too distant past it was believed that the growth of idiomatic instrumental music was primarily the achievement of the early seventeenth century, but instrumental treatises such as Silvestro Ganassi’s La Fontegara (1535) and Diego Ortiz’s Trattado de glosas sobre clausulas (1553), with its discourse on solo viol playing with keyboard accompaniment, conclusively prove that the solo sonata had long precedent. Sets of variations such as Marini’s Romanesca derive directly from these improvisatory practices. It is nevertheless true that only from the turn of the century is there a substantial repertory of published works for small ensembles of one to three instruments and continuo. Among the earliest of these are the few instrumental pieces contained in Gian Paolo Cima’s large collection of sacred vocal music, the Concerti ecclesiastici of 1610. As he was then organist at S. Celso in Milan, it seems that the structures on the use of instruments in church made by the austere Milanese Archbishop Carlo Borromeo at the time of the Council of Trent had had no lasting impact in the city. Cima’s works are by no means mere prototypes of the genre, but combine rapid passage-work with sections of strict polyphony into highly complex and original structures. In a note to the Benign Reader he asks the performer to refrain from using impromptu embellishments – a not uncommon attitude of composers in the seventeenth century. The florid written-out divisions in many early seventeenth-century sonatas may indeed suggest a reaction against the improvisatory freedom allowed in the sixteenth century. It was in the 1620s that the sonata for small ensemble triumphed over every other instrumental medium, as demonstrated by the two collections of Dario Castello (1621 and 1629). Of the twenty-nine pieces, only five call for his largest combination of four instruments and continuo, although it has to be said that Biagio Marini’s Opus 8 is slightly unusal in its inclusion of six canzoni a 4 and four canzoni a 6 along with its forty or so pieces for one, two and three instruments. On its title page, Marini refers to ‘curiose et moderne inventione’, no doubt referring to such features as the use of scordatura and extensive chordal playing on the violin, while Castello styles his collections as ‘Sonate concertate in stil moderno’; there can be little doubt that both composers were deliberately catering for the current vogue for novelty. The extent of Marini’s endeavours in this direction may easily be gauged by comparing the substantial pieces of Opus 8 such as the Sonata quarta per sonar con due corde with the three early Sinfonias from his Opus 1 (1617/8), La Orlandina, La Gardana and La Ponte, although the comparison is slightly misleading in that all three offer the option ‘violino ò cornetto’, obviously imposing certain restrictions on the style of writing. It also has to be acknowledged that Castello, who was himself a Venetian wind player, may have intended cornetto by his ambiguous ‘soprano’, although this is certainly ruled out by the wide range of the part in the Sonata seconda a sopran solo. Whatever the case, these sonatas of the third decade of the century show a colossal increase in technical demands, and this was fully acknowledged by Castello in the 1629 reprint of his Opus 1, where he advises the Reader that ‘although at first sight these sonatas of mine may appear difficult, their spirit will not be destroyed by playing them more than once, and in doing so they will become practised, thus rendering them the easiest of works to play’. The burgeoning sonata for small ensembles reached a peak in the 1620s. The apparent massive decline after 1630 is probably attributable not to a lack of interest but to the collapse of the Venetian publishing industry, a victim of the grave economic crisis brought about by the cataclysmic plague which followed the Imperial troops as they marched across the plains of Northern Italy to the Sack of Mantua in 1628. Although the industry never fully recovered, the situation had improved by the late 1630s when the priest violinist, Marco Uccellini began his remarkably productive career spanning a period of thirty years. Without his contribution, the history of the Italian solo sonata in the mid-century would be bleak indeed. All this development from the early years of the century was very much confined to the regions of Northern Italy which had easy access to the Venetian publishing houses. In the 1660s, however, the Bolognese presses suddenly awakened to the commercial exploitation of the musical dilettante, and cornered the market in lightweight da camera music, mainly dances. Alessandro Stradella, however, learnt his instrumental style in Rome where the greatest instrumentalists of the day hardly ever published their instrumental music. This would not have been in the interests either of the patron or the performer, both of whom naturally wished to keep his music to himself, and apart from an occasional piece in an anthology, Stradella’s music therefore remains in manuscript. The chronology (and sometimes even the authorship) of these hand-written sources is debatable, but all predate 1682 when Stradella met an untimely end at the hands of an assassin. It is immediately evident from the toccata-like opening of Sinfonia 22 (a notable feature of the Roman sinfonia) that this is music for professional performers rather than amateur noblemen, since it requires a degree of competence never encountered in the instrumental duos then issuing from the Bolognese presses. It is a remarkably persistent belief of Northern Europeans that Italian music of this period is homogeneous, but the enormous differences even between Cima’s Milanese compositions and the Venetian works of Castello, let alone the Roman sinfonias of Stradella, reveal a rich stylistic diversity. There are nevertheless certain consistencies of medium which cross these regional divides. Most Italian composers observed a sharp distinction between the solo and duo sonata, as seen at its most extreme in the two sonatas from Marco Uccellini’s Opus 4 (1645) La luciminia contenta a violino solo and the Sonata ottava a violino e basso. (Note that ‘basso’ refers to the melodic bass instrument, since Italian designations almost never include the continuo.) In Uccellini’s composition ‘a violino solo’ the basso continuo provides an unobtrusive, largely non-thematic harmonic support very occasionally providing an imitation during a rest in the violin part. It functions almost exclusively as a foil for the florid display of divisions in the violin in which most interest resides. In his duo sonata, however, each melodic part is of equal thematic importance in an intricate polyphonic texture and this is the raison d’être of the piece rather than instrumental virtuosity. The continuo is now relegated to its traditional role as ‘basso seguente’, simply doubling the bass part, and in all probability much of the violin part would have been reproduced in the realization. This absolute distinction of genre remained remarkably intact throughout most of the seventeenth century as can be seen from Stradella’s Sinfonia 22, but was soon to be superseded by the new unaccompanied duo which combined the virtuosity of the solo sonata with the imitative fabric of the sonata a 2, as represented by Corelli’s Opus 5. 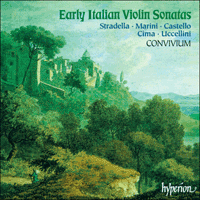 Judging from printed editions, the duo sonata was fairly popular in the first half of the seventeenth century, whereas it was not until Uccellini’s Sonate e canzoni a violino solo of 1649 that a collection of solo violin sonatas appeared. This may seem odd in the country that not only invented the violin but whose violinists were renowned thoughout the courts of Europe. This enigma may easily be explained simply because it was impossible to print complex violin music within the system of typography then used by all Italian publishers. Chordal writing, for instance, was virtually ruled out as notes could not be superimposed. When Uccellini wished to include almost continuous double stops in several pieces of his Opus 7 (1660) he was forced to publish two separate violin parts for the one violin which the performer would then need to write out! Published solo sonatas would have to be written in a specific way to take account of these limitations and cannot therefore be taken as a true representation of advanced violin playing in Italy. Virtuoso violin music circulated in manuscript, most of which has subsequently been lost. Consequently, almost nothing survives of the most famous players of the day such as Alfonso Pagano dal violino and Ercole Gaibara, both of whom enjoyed much more esteem than the relatively little-known Uccellini who spent much of his life in the confines of the Court of Modena. It is against this background that the extreme importance of Marini’s Opus 8 (1626/9) becomes apparent. The Sonata per sonar con tre corde a modo di Lira and the Sonata quarta per sonar con due corde contain the most extensive chordal writing of any Italian solo violin sonatas until the last quarter of the seventeenth century. Various doubtful theories have been advanced to explain this phenomenon, attributing their inclusion to his presence at the Court of Neuberg where apparently German violinists were much more skilled, but this would negate the whole purpose of his engagement there as one of the best violinists of the day. Once more, the explanation lies entirely in the technical problems of production. While most of Opus 8 is typeset in the normal manner, the chordal passages in the violin have been carved in woodblock – a long and expensive process which few music publishers would ever have entertained if only on financial grounds. Scholars have often noted the discrepancy between the printed date of its publication as MDCXXVI and the emendation in ink to MDCXXVIIII, but a delay of three years between the inscribing of the title page and the final publication may not have been an unreasonable time-span. This was an experiment that other Italian publishers did not wish to copy, and this accounts for the absence of double-stopping in Italian prints of violin sonatas over the next fifty years. Corelli’s Opus 5 in 1700 was the first set of advanced violin sonatas to be produced in Italy using the new method of copper-plate engraving. We must reconcile ourselves to the fact that the true state of Italian violin playing from Marini’s Opus 8 until the early eighteenth century is likely to remain a closed book to us. Voilà peu encore, l’on croyait que le développement de la musique instrumentale idiomatique était essentiellement le fait du début du XVIIe siècle, mais des traités instrumentaux tels que La Fontegara (1535) de Silvestro Ganassi et le Trattado de glosas sobre clausulas (1553) de Diego Ortiz, avec son discours du jeu de viole solo avec accompagnement de clavier, établissent définitivement que la sonate pour instrument seul connut un long précédent. Les corpus de variations comme la Romanesca de Marini proviennent directement de ces pratiques d’improvisation, même s’il est vrai que seul le début du XVIIe siècle connaîtra un important répertoire d’œuvres publiées pour petits ensembles de un à trois instruments et continuo. Parmi les toutes premières de ces œuvres figurent les rares pièces instrumentales contenues dans le grand recueil de musique vocale sacrée de Gian Paolo Cima, les Concerti ecclesiastici (1610). Leur compositeur était alors organiste de S. Celso de Milan et les restrictions sur l’usage des instruments dans l’église, imposées par l’austère archevêque milanais Carlo Borromeo au moment du Concile de Trente, n’ont apparemment pas eu d’impact durable dans la cité. Les œuvres de Cima, qui ne sont en rien de simples prototypes du genre, combinent des passages rapides à des sections de polyphonie stricte en des structures extrêmement complexes et originales. Dans une note au lecteur bénin, il demande à l’interprète de s’abstenir de tout ornement impromptu – usage fréquent chez les compositeurs du XVIIe siècle. Les divisions fleuries, écrites en toutes notes, de maintes sonates du début du XVIIe siècle peuvent suggérer une réaction contre la liberté d’improvisation accordée au XVIe siècle. Ce fut dans les années 1620 que la sonate pour petit ensemble triompha des autres moyens instrumentaux, comme l’attestent les deux recueils de Dario Castello (1621 et 1629), dont seules cinq pièces sur vingt-neuf requièrent la plus grande combinaison instrumentale du compositeur, savoir quatre instruments et continuo; il convient toutefois de souligner que l’op.8 de Biagio Marini présente un trait légèrement insolite en l’inclusion de six canzoni a 4 et de quatre canzoni a 6 aux côtés d’une quarantaine de pièces pour un, deux ou trois instruments. Sur sa page de titre, Marini mentionne une «curiose et moderne inventione», faisant sans doute allusion à des caractéristiques telles que l’usage de la scordatura et d’un ample jeu en accords au violon, cependant que Castello intitule ses recueils «Sonate concertate in stil moderno»; il ne fait guère de doute que les deux compositeurs répondirent alors délibérément à la vogue de la nouveauté. L’étendue des efforts de Marini en ce sens peut être aisément évaluée en comparant les substantielles pièces de l’op.8, telle la Sonata quarta per sonar con due corde, avec les trois sinfonias de son op.1 (1617/8), La Orlandina, La Gardana et La Ponte, même si cette comparaison est rendue quelque peu fallacieuse par le fait que chacune de ces trois pièces offre l’option «violino ò cornetto», source évidente de certaines restrictions quant au style d’écriture. Force est également d’admettre que Castello, lui-même joueur d’instrument à vent vénitien, a pu désigner le «cornetto» par son ambigu «soprano», bien que cette hypothèse soit assurément exclue par la large étendue de la partie dans la Sonata seconda a sopran solo. Quoi qu’il en soit, ces sonates des années 1630 témoignent d’un colossal accroissement des exigences techniques – réalité parfaitement reconnue par Castello, qui avise ainsi le lecteur, dans la réimpression de son op.1 (1629): «Même si mes sonates peuvent, à première vue, sembler difficiles, les jouer plus d’une fois ne détruira pas leur esprit mais fera que l’on s’y exercera et qu’elles deviendront les œuvres les plus faciles à jouer». La sonate naissante pour petits ensembles atteignit à un apogée dans les années 1620. Son apparent déclin massif, après 1630, est probablement imputable non à un manque d’intérêt mais à l’effondrement de l’industrie éditoriale vénitienne, victime de la grave crise économique provoquée par le cataclysme qui suivit les troupes impériales tout au long de leur marche à travers les plaines de l’Italie du Nord, jusqu’au sac de Mantoue (1628). Bien que l’industrie ne s’en remît jamais pleinement, la situation s’améliora à la fin des années 1630, lorsque le prêtre-violoniste Marco Uccellini entama une longue – trente ans – carrière remarquablement productive, sans laquelle l’histoire de la sonate italienne pour instrument seul du milieu du XVIIe siècle serait véritablement morne. Ce développement né dans les premières années du XVIIe siècle se limita presque exclusivement à l’Italie septentrionale, qui avait facilement accès aux maisons d’édition vénitiennes. Dans les années 1660, pourtant, les presses bolognaises prirent soudain conscience de l’exploitation commerciale des dilettantes et accaparèrent le marché de musiques légères da camera, surtout des danses. Alessandro Stradella apprit, pour sa part, son style instrumental à Rome, où les plus grands instrumentistes de l’époque ne publiaient presque jamais leur musique instrumentale. Ni le patron, ni l’interprète n’y avaient intérêt, chacun souhaitant naturellement garder ces musiques pour lui, et, excepté de rares pièces parues dans des anthologies, la musique de Stradella demeure à l’état de manuscrits. La chronologie (et parfois même la paternité) de ces sources manuscrites est discutable, mais toutes sont antérieures à 1682, année de la mort prématurée du compositeur, assassiné. L’ouverture de type toccata de la Sinfonia 22 (une caractéristique remarquable de la sinfonia romaine) nous prouve d’emblée que cette musique est destinée à des interprètes professionnels plutôt qu’à des nobles amateurs, car elle requiert un degré de compétence totalement absent des duos instrumentaux qui sortaient alors des presses bolognaises. Une croyance extraordinairement tenace chez les Européens du Nord veut que la musique italienne de cette époque soit homogène, mais les énormes différences entre les compositions milanaises de Cima et les œuvres vénitiennes de Castello, sans parler des sinfonias romaines de Stradella, révèlent une riche diversité stylistique. Certaines constantes de moyen d’expression n’en franchissent pas moins ces clivages régionaux. La plupart des compositeurs italiens opérèrent ainsi une nette distinction entre la sonate pour instrument seul et la sonate en duo, comme l’attestent, de la manière la plus extrême, les deux sonates de l’op.4 de Marco Uccellini (1645), La luciminia contenta a violino solo et la Sonata ottava a violino e basso. (À noter que «basso» se réfère à l’instrument mélodique de tessiture grave, les désignations italiennes n’incluant presque jamais le continuo.) Dans la composition «a violino solo» d’Uccellini, la basse continue fournit un soutien harmonique discret, largement non thématique, offrant très rarement une imitation pendant une pause dans la partie de violon. Elle fonctionne quasi uniquement comme un faire-valoir au déploiement fleuri de divisions au violon, principal intérêt de la pièce. Dans la sonatine en duo, a contrario, chaque partie mélodique est de même importance thématique, dans une texture polyphonique complexe, et constitue la raison d’être de l’œuvre – qui ne réside plus dans la virtuosité instrumentale. Le continuo est désormais relégué à son rôle traditionnel de «basso seguente», doublant simplement la partie de basse, et, selon toute probabilité, l’essentiel de la partie de violon était reproduit dans la réalisation. Cette absolue distinction de genre demeura remarquablement intacte pendant la majeure partie du XVIIe siècle, comme l’atteste la Sinfonia 22 de Stradella, pour être bientôt remplacée par le nouveau duo sans accompagnement, combinaison de la virtuosité de la sonate pour instrument seul et du tissu imitatif de la sonata a 2, représentée par l’op.5 de Corelli. À en juger d’après les éditions imprimées, la sonate en duo fut assez populaire dans la première moitié du XVIIe siècle, alors qu’il fallut attendre les Sonate e canzoni a violino solo d’Uccellini (1649) pour qu’un recueil de sonates pour violon solo parût. Ce qui peut sembler curieux dans un pays qui non seulement inventa le violon, mais dont les violonistes étaient renommés dans toutes les cours d’Europe. Cette énigme s’explique sans peine par l’impossibilité d’imprimer des pièces pour violon complexes dans le cadre du système typographique alors en usage chez tous les éditeurs italiens. L’écriture en accords, par exemple, était pratiquement exclue, puisque les notes ne pouvaient être surimposées. Quand Uccellini souhaita inclure des doubles cordes quasi continues dans plusieurs pièces de son op.7 (1660), il fut contraint de publier deux parties de violon séparées pour le violon que l’interprète devait ensuite écrire en toutes notes! Les sonates pour un seul instrument publiées devaient être écrites spécifiquement pour prendre en compte ces limites et ne sauraient donc être considérées comme véritablement représentatives du jeu violonistique avancé en Italie. La musique pour violon virtuose circula sous forme de manuscrits qui ont, pour la plupart, été perdus depuis. Aussi ne reste-t-il pratiquement rien des plus célèbres interprètes de l’époque, tels Alfonso Pagano dal violino et Ercole Gaibara qui jouirent d’une estime bien supérieure à celle du relativement méconnu Marco Uccellini, dont la vie se limita surtout à la cour de Modène. C’est dans ce contexte que l’extrême importance de l’op.8 de Marini (1626/9) devient flagrante. La Sonata per sonar con tre corde a modo di Lira et la Sonata quarta per sonar con due corde recèlent la plus vaste écriture en accords de toutes les sonates italiennes pour violon solo écrites avant les années 1675. Diverses théories douteuses ont été émises pour expliquer ce phénomène, selon lesquelles l’inclusion de ces sonates serait due à la présence de leur compositeur à la cour de Neuberg, forte de violonistes allemands apparemment beaucoup plus talentueux; mais cette hypothèse contredit le dessein même de l’engagement de Marini à la cour de Neuberg comme l’un des meilleurs violonistes de l’époque. Une fois encore, l’explication réside entièrement dans les problèmes techniques de production. Si l’essentiel de l’op.8 est composé normalement, les passages violonistiques en accords ont été gravés sur bois – un processus long et coûteux que peu d’éditeurs de musique envisageaient, ne fût-ce que sur un plan financier. Les spécialistes ont souvent noté la différence entre la date de publication imprimée – MDCXXVI – et la date corrigée à l’encre – MDCXXVIIII –, mais un délai de trois ans entre l’inscription de la page de titre et la publication finale n’a rien de déraisonnable. Les autres éditeurs italiens n’ayant pas souhaité renouveler cette expérience, les doubles cordes sont absentes des éditions italiennes de sonates pour violon publiées dans les cinquante années suivantes. L’op.5 de Corelli fut, en 1700, le premier corpus de sonates pour violon avancées produit en Italie grâce au nouveau procédé de la chalcographie. Nous devons nous résigner au fait que le véritable état du jeu violonistique italien entre l’op.8 de Marini et le début du XVIIIe siècle nous restera probablement abstrus. Vor nicht allzu langer Zeit glaubte man noch, daß die Zunahme idiomatischer Instrumentalmusik vorrangig dem frühen siebzehnten Jahrhundert zu verdanken sei. Doch instrumentale Abhandlungen wie Silvestro Ganassis La Fontegara (1535) und Diego Ortiz’ Trattado de glosas sobre clausulas (1553) mit seinem Diskurs über ein von einem Tasteninstrument begleitetes Violinsolo sind eindeutig Beweis dafür, daß es die Solosonate schon lange zuvor gab. Eine Reihe von Variationen wie Marinis Romanesca gehen unmittelbar auf diese Improvisationen zurück. Nichtsdestotrotz stimmt es, daß erst ab der Jahrhundertwende ein nennenswertes Repertoire an Werken für kleine Ensembles von ein bis zwei Instrumenten und continuo veröffentlicht wurde. Zu den frühesten davon zählen die wenigen Instrumentalstücke aus Gian Paolo Cimas großer Sammlung an Kirchengesängen, der Concerti ecclesiastici aus dem Jahre 1610. Zu jener Zeit war er Organist von San Celso in Mailand und es scheint, daß die strengen, vom Mailänder Erzbischof Carlo Borromeo zur Zeit der Trentiner Konzils getroffenen Bestimmungen zur Verwendung von Instrumenten in der Kirche in der Stadt keinen andauernden Bestand hatten. Bei Cimas Werken handelt es sich keineswegs nur um Prototypen dieses Genres; es werden vielmehr schnelle Passagen mit Abschnitten strikter Polyphonie zu äußerst komplexen und einzigartigen Strukturen verbunden. In einer Anmerkung an den geneigten Leser bittet er den Künstler von spontanen Verschnörkelungen abzusehen – einer nicht ganz ungewöhnlichen Eigenart von Komponisten des siebzehnten Jahrhunderts. Die blumig ausgearbeiteten Unter­teilungen in vielen Sonaten des frühen siebzehnten Jahrhunderts lassen wohl tatsächlich auf eine Reaktion gegen die im sechzehnten Jahrhundert gewährte Freiheit der Improvisation schließen. In den zwanziger Jahren des siebzehnten Jahrhunderts triumphierte die Sonate für kleines Ensemble über jedes andere musikalische Medium, wie wir an den beiden Sammlungen von Dario Castello (1621 und 1629) sehen können. Lediglich fünf der neunundzwanzig Stücke verlangen nach seiner umfangreichsten Kombination von vier Instrumenten und continuo, wenn es auch zu erwähnen gilt, daß Biagio Marinis Opus 8 durch die Einbeziehung von sechs canzoni a 4 und vier canzoni a 6 neben rund vierzig Stücken für ein, zwei bzw. drei Instrumente etwas ungewöhnlich wirkt. Auf der Titelseite spricht Marini von ‘curiose et moderne inventione’, womit er sich zweifelsohne auf Charakteristika wie die Verwendung von scordatura und das ausgiebige akkordische Spiel der Violine bezieht, während Castello seine Sammlung ‘Sonate concertate in stil moderno’ tauft. Zweifelsohne bewegten sich beide Komponisten auf der Welle des Neuen. Das Ausmaß von Marinis Unternehmungen in diese Richtung kann man leicht messen, indem man die gehaltvollen Stücke des Opus 8, wie die Sonata quarta per sonar con due corde mit den drei frühen Sinfonien aus dem Opus 1 (1617/18), La Orlandina, La Gardana und La Ponte vergleicht. Ein Vergleich kann allerdings auch etwas irreführend sein, da alle drei die Option ‘violino ò cornetto’ bieten und den Kompositionsstil offensichtlich auf gewisse Weise einschränken. Es muß aber auch erwähnt werden, daß Castello, der selbst ein venezianischer Blasinstrumentist war, mit seinem zweideutigen ‘soprano’ wohl ein cornetto beabsichtigte, wenn dies auch in der Sonata seconda a sopran solo aufgrund des enormen Umfangs dieses Abschnitts mit Sicherheit ausgeschlossen werden kann. Wie auch immer, diese Sonaten aus dem dritten Jahrzehnt jenes Jahrhunderts weisen eine kolossale Steigerung der technischen Ansprüche auf, was Castello auch 1629 gebührend in seinem Nachdruck des Opus 1 würdigte. Darin rät er dem Leser, daß ‘diese meine Sonaten auf den ersten Blick auch schwierig erscheinen mögen, doch geht ihr Geist nicht dadurch verloren, daß sie mehr als nur einmal gespielt werden; sie wirken damit sogar zunehmend gekonnter und werden zu einem der am leichtesten zu spielenden Werke’. Die Blütezeit der Sonate für kleine Ensemble erreichte ihren Höhepunkt in den zwanziger Jahren des siebzehnten Jahrhunderts. Die offensichtlich beträchtliche Abnahme nach 1630 ist möglicherweise nicht auf mangelndes Interesse, sondern auf den Zusammenbruch der venezianischen Verlagshäuser zurückzuführen. Diese fielen der schweren Wirtschaftskrise zum Opfer, zu der es in Folge der verheerenden Pest kam, welche den kaiserlichen Truppen auf ihrem Marsch durch die Ebenen Norditaliens zur Plünderung Mantuas im Jahre 1628 folgte. Zwar konnte sich das Verlagswesen davon nie richtig erholen, doch gegen Ende der dreißiger Jahre hatte sich die Situation verbessert, als nämlich der Priester und Violinist Marco Uccellini seine erstaunlich produktive Karriere begann, die sich über einen Zeitraum von dreißig Jahren erstreckte. Ohne seinen Beitrag wäre die Geschichte der italienischen Solosonate in der Mitte jenes Jahrhunderts in der Tat trübe. All diese Entwicklungen ab Beginn des Jahrhunderts beschränkten sich im wesentlichen auf die Regionen Norditaliens, denen die venezianischen Verlagshäuser leicht zugänglich waren. In den sechziger Jahren wurde den Verlegern Bolognas die kommerzielle durch Amateurmusiker bewußt, und man belegte eine Nische des Marktes mit leichter da camera-Musik, die vornehmlich zum Tanz bestimmt war. Alessandro Stradella hingegen erlernte sein musikalisches Handwerk in Rom, wo die größten Instrumentalisten der Zeit ihre Werke kaum jemals verlegten. Dies hätte weder im Interesse des Gönners noch des Künstlers gestanden, die beide natürlicherweise wünschten, die Musik für den eigenen Gebrauch zu reservieren. Von dem ein oder anderen Stück im Rahmen einer Anthologie abgesehen, blieb Stradellas Musik daher lediglich in Manuskriptform erhalten. Die Chronologie (und gelegentlich auch die Urheberschaft) dieser handgeschriebenen Quellen bleibt umstritten; doch alle stammen aus der Zeit vor 1682, als Stradella einem Mordanschlag zum Opfer fiel und frühzeitig den Tod fand. An der toccata-artigen Eröffnung der Sinfonia 22 (einer bemerkens­werten Eigenschaft der Römischen Sinfonia) erkennt man sofort, daß es sich hierbei vielmehr um Musik für professionelle Musiker handelt als für amateurhafte Edelmänner. Nicht zuletzt ist dabei ein Kompetenzgrad erforderlich, den man bei den damals von den Bologneser Verlagen herausgegebenen Instrumentalduos noch nicht kannte. In Nordeuropa hält sich erstaunlicherweise der Glaube daran, daß die italienische Musik jener Periode homogen gewesen sei, doch offenbaren die enormen Unterschiede selbst zwischen Cimas Mailänder Kompositionen und den venezianischen Werken Castellos, ganz zu schweigen von Stradellas Römischen Sinfonien, eine große stilistische Vielfalt. Im Bereich des musikalischen Mediums gibt es nichtsdestotrotz eine gewisse Beständigkeit, die diese regionalen Grenzen überschreitet. Die meisten italienischen Komponisten hielten sich an eine strikte Abgrenzung zwischen der Solo- und Duosonate, wie man im extremsten an den beiden Sonaten aus Marco Uccellinis Opus 4 (1645) La luciminia contenta a violino solo und der Sonata ottava a violino e basso erkennt. (‘Basso’ bezieht sich hier auf das melodische Baßinstrument, da bei italienischen Benennungen fast nie der continuo erscheint.) Bei Uccellinis Komposition ‘a violino solo’ bietet der basso continuo eine unaufdringliche, größtenteils nicht zum Thema gehörende Harmoniestütze, die während einer Pause in der Violinpartitur gelegentlich eine Nachahmung bietet. Sie fungiert fast völlig als Hintergrund für die kräftigen Sprünge der Violine, die im Mittelpunkt des Interesses stehen. In seinem Sonatenduett ist jedoch jeder Melodieteil in einer feinen polyphonischen Textur von gleicher thematischer Bedeutung. Und dies ist viel eher die raison d’être des Stückes als die instrumentelle Virtuosität. Der continuo kehrt nun zu seiner traditionellen Rolle als ‘basso seguente’ zurück, indem einfach der Baßteil verdoppelt und höchstwahrscheinlich ein Großteil der Violinpartitur in der Realisierung wiedergegeben wurde. Die absolute Abgrenzung der Genres blieb überraschenderweise während fast des gesamten siebzehnten Jahrhunderts erhalten, wie sich an Stradellas Sinfonia 22 erkennen läßt; bald aber schon wurde sie vom neuen unbegleiteten Duett abgelöst, das die Virtuosität der Solosonate mit der nachahmenden Struktur der sonata a 2 verband, die wir in Corellis Opus 5 finden. Die gedruckten Editionen weisen darauf hin, daß das Sonatenduett in der ersten Hälfte des siebzehnten Jahrhunderts ziemlich beliebt war. Im Gegensatz dazu erschien mit Uccellinis Sonate e canzoni a violino erst 1649 eine Sammlung von Sonaten für Solovioline. Dies mag merkwürdig erscheinen für das Land, das nicht nur die Geige erfand, sondern dessen Violinisten an den Höfen ganz Europas angesehen waren. Dieses Rätsel mag ganz einfach dadurch gelöst werden, daß es mit dem zu jener Zeit von den italienischen Verlegern verwendeten Systems des Buchdrucks nicht möglich war, komplexe Violinmusik zu Papier zu bringen. Die Akkordkomposition zum Beispiel schied damit praktisch aus, da in ihr Noten nicht übereinander gelagert werden konnten. Als Uccellini in verschiedenen Stücken seines Opus 7 (1660) fast fortlaufend Doppelgriffe verwenden wollte, sah er sich gezwungen, für eine einzige Geige zwei separate Violinpartituren zu veröffentlichen, die der Künstler dann selbst ausarbeiten mußte! Um diese Einschränkungen zu berücksichtigen galt es, publizierte Solosonaten auf spezielle Weise zu schreiben. Diese können daher nicht als wahres Spiegelbild der hervorragenden Violintradition Italiens betrachtet werden. Virtuose Violinmusik zirkulierte in Form von Manuskripten; die meisten davon gingen später verloren. Letztendlich bleibt uns kaum etwas erhalten von den berühmtesten Instrumentalisten jener Zeit, wie zum Beispiel Alfonso Pagano dal violino und Ercole Gaibara, die beide weitaus größeres Ansehen genossen als der relativ unbekannte Marco Uccellini, der einen Großteil seines Lebens in der Abgeschlossenheit des Hofes von Modena verbrachte. Vor diesem Hintergrund kommt die enorme Bedeutung von Marinis Opus 8 (1626/29) zur Geltung. Die Sonata per sonar con tre corde a modo di Lira und die Sonata quarta per sonar con due corde enthalten die ausgiebigste Akkordkomposition einer italienischen Solo-Violinsonate vor dem letzten Viertel des siebzehnten Jahrhunderts. Zur Erklärung dieses Phänomens wurden einige zweifelhafte Theorien angeführt, die deren Einbeziehung der Anwesenheit Marinis am Hofe zu Neuburg zuschrieben, wo anscheinend deutsche Violinisten so viel begabter waren, doch stünde dies ganz im Gegensatz zum eigentlichen Zweck seiner Anstellung als einer der besten Violinisten seiner Zeit. Die Erklärung ist wieder einmal alleine in den technischen Problemen der Produktion zu finden. Das Opus 8 ist hauptsächlich in der sonst üblichen Weise gesetzt. Die Akkordpassagen der Violine schnitzte man in Holz – ein langwieriges und kostspieliges Verfahren, das schon aus finanziellen Gründen kaum ein Musik­verleger unternommen hätte. Gelehrte haben nicht selten auf die Diskrepanz zwischen dem gedruckten Veröffentlichungsjahr MDCXXVI und dem mit Tinte nachgebesserten MDCXXVIIII hingewiesen, doch sind drei Jahre vom Beschriften der Titelseite und der endgültigen Veröffentlichung keine ungewöhnliche Zeitspanne. Dieses Experiment wollten andere italienische Verleger nicht wiederholen, und deshalb findet man während der folgenden fünfzig Jahre keine Doppelgriffe in italienischen Drucken für Violinsonaten. Corellis Opus 5 aus dem Jahre 1700 war die erste Zusammenstellung von Violinsonaten, die in Italien mit der neuen Kupferstichtechnik hergestellt wurde. Wir müssen uns mit der Tatsache vertrösten, daß die wahre Qualität des italienischen Violinspiels zwischen Marinis Opus 8 und dem frühen achtzehnten Jahrhundert wohl ein Buch mit sieben Siegeln bleiben wird.